Our organizational titles don’t protect us from becoming entangled with energies, situations, circumstances or feelings of being stuck. Whether it is a simple matter of having our “knickers in a twist” or something far more serious, entering and sustaining a state of embodied toxic feelings is, quite simply, bad for our health. Meditation, intense physical exercise, spiritual practices, somatic therapies and vacations can break the pattern, help us gain perspective and bring us closer to embodying balance. While at a pastoral health retreat in the 90’s I listened to a presentation on secret recipes for changing perspective and letting go of negative obsessive thoughts and their attendant feelings. A well-heeled beauty described a process for reducing feelings of fear and frustration arising from perceived threats and obstacles. Her formula called for parchment paper, “Do As I Say Oil”, raw egg, raw hamburger, a paper bag and freezer. The instructions were simple: on the parchment paper write down the problem, obstacle or person that was interfering in your life, tear up the paper and mix it with everything above; put it in the bag and freeze it. Yes, I was aghast at the thought and could not imagine rustling up this recipe under any circumstance! Years later in one seriously desperate moment of feeling backed into a corner my survival impulse ignited and voila!… I remembered the recipe. I am a vegetarian and had no idea where to find “Do As I Say Oil”… My shortcut recipe worked well. Ingredients: paper, envelope, and freezer. Write the problem/obstacle on a piece of paper, tear it to shreds, pour the bits into an envelope, seal it and place it in the freezer. See the energy being stopped – frozen in your life. There was no more need to send hostile thought darts at the perpetrator of my unrest. Things improved. After reading Siri Carpenter’s article “Body of Thought” in Scientific American MIND this experience makes sense. Studies on embodied cognition confirm that people are more at peace with their decisions when they wash their hands after making the decision; we perceive others as warm when we are holding a warm beverage; and, we become a tougher negotiator when we sit on a hard chair. The feelings we embody influence our perceptions. Perception and embodiment cannot be separated. The results of a study cited in Siri Carpenter’s article revealed that Botox recipients did not readily perceive sadness and anger in the faces of others because their ability to embody these emotions in the micro movements and mirroring ability of their facial muscles was constrained. The center of emotion in the brain, the amygdala was “muted” by the paralyzing effects of Botox in the muscles. The inspiring stories of people overcoming disease are stories of people successfully embodying health over imbalance. 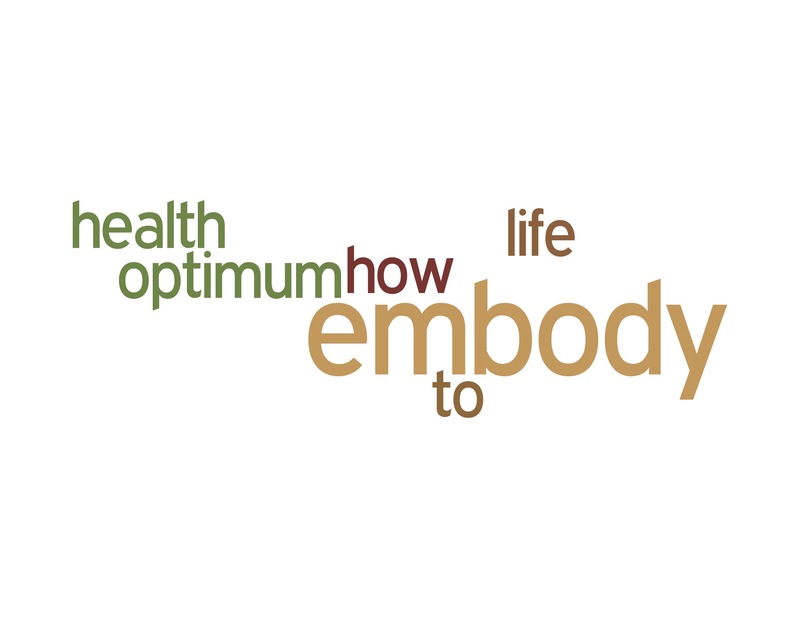 As we learn and live our individually unique recipe for embodying optimum health we are tuned to our body genius. Changing our work structures, schedules, beliefs and bad embodiment habits (ex: how we automatically feel when we are stuck in traffic) requires courage and self-awareness. Cures for modern disease begins here. Considering the confusion, costs, waste and fear embedded in and embodied by too much of the U.S. “health care system” our primary hope as individuals is to assume total responsibility for what we embody. is a quantum leap in our attention and self-awareness. “Attune to my Body Genius” is a necessary addition to a smart“Get It Done” list. When we put that statement at the top of our “list” we are priming our subconscious mind to support our health and well-being. Cheers to dancing, drawing, writing, walking, running, cycling, swimming, surfing, drumming, golfing, playing et al… our dreams, prayers, health and well-being. Your Turn: What will you embody today?